For the last two weeks, the United States men’s national team has had your neighbor talking about 4-3-3 formations, the lady on the bus wearing a Clint Dempsey–riding-Falkor T-shirt, and has probably been the reason dozens of babies will be named John Anthony in nine months. The American players helped inspire a palpable passion around the game in this country, unlike anything we’ve felt before. And they helped make this truly extraordinary World Cup one that none of us will ever forget. With the United States’s exit from the tournament at the hands of Belgium, a few Grantland writers — Brian Phillips, Chris Ryan, Mike L. Goodman, Noah Davis, Ryan O’Hanlon, and Bill Barnwell — wanted to take the opportunity to pay tribute to the players that gave us so much this summer. Brian Phillips: Is it still possible to think in sentences? Is it still possible to think at all? When I try to come to terms with what Tim Howard did yesterday, my brain just, like, kaleidoscopes. I mean, I see fireworks. I see stars. I see imaginary GIFs where the ball explodes every time he punches it. I see shocked Belgian attackers staring up at him like Wildlings catching their first sight of an ice wall 800 feet high: You mean we have to go through that? I see him yelling at his defenders, pointing his big gloves like someone showing 10 wobbly pins how not to be afraid of a bowling ball. I have watched hundreds of hours of soccer in my life. Thousands. If a thing can happen on the pitch, I’ve seen it. I’ve watched 4-0 leads erased in minutes. I’ve watched managers fight their own players. I’ve watched a star for FC Barcelona receive a standing ovation at the Bernabéu, the home of Real Madrid. I’ve seen every kind of insanity and every kind of brilliance. I’m not saying this to brag. I just want to establish some context. 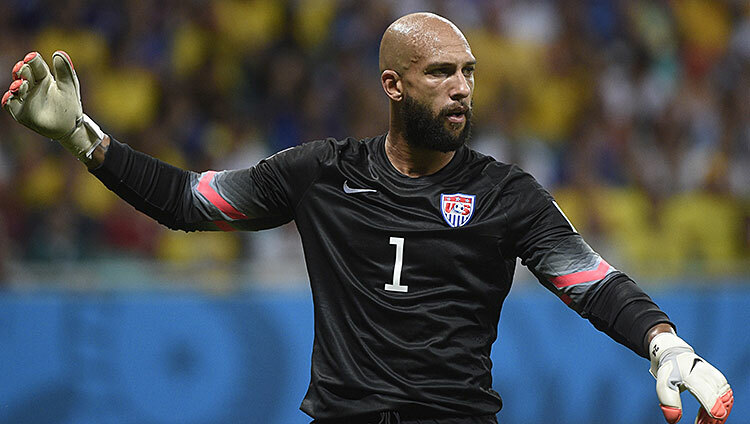 Because I’ve never seen anything like what Tim Howard did yesterday. In fact, no one has seen anything like what Howard did yesterday, because it’s never happened before, at least not in living memory. Howard’s 16 saves were the most recorded by a World Cup goalkeeper since FIFA started keeping the statistic nearly half a century ago. To put that number in perspective: Only six other teams in 2014 have recorded more than 16 saves over the entire tournament. Howard faced 39 shots — 39! — as a polished Belgium attack repeatedly overwhelmed the hardworking but very outclassed American defense. He was the only thing that kept this 2-1 Belgium win from being a beatdown for all time. He saved shots in every way possible. Against Divock Origi one minute into the game, flinging out his right shin in the corner of the area. Against Jan Vertonghen, diving forward and clutching the ball to his chest. Against Kevin Mirallas, sliding sideways with his left foot. Against Dries Mertens, leaping up to tip the ball over the crossbar. This has been, in many ways, the World Cup of astonishing goalkeepers — Guillermo Ochoa, Vincent Enyeama, Keylor Navas; think of Júlio César in the penalty shootout against Chile — but Howard’s performance was a different grade of math. And here’s what I wanted to say about him. When it was bad, you knew it could have been worse. When it got worse, you knew it could have been terrible. When it got terrible, you knew there was hope left, just a thread of it, but something to hold on to. You knew those things because he was there. If you watched the last two minutes in a heart-imploding frenzy, urging the U.S. to get forward and score the tying goal, the life you felt was the gift he gave you, because without him the match would have been over long before. I don’t care that the U.S. lost. He goes into the lore. When the aged DeAndre Yedlin is hoisting the World Cup in 2026, Tim Howard is the background, in the same way that Brian McBride’s bloody face is the background and Landon Donovan’s goal against Algeria is the background. He matters to American soccer forever because of this match. We lost, but he still saved us. Chris Ryan: Before this tournament, Noah Davis wrote about how the 2014 World Cup was going to be the end of an era for the USMNT. We would be waving good-bye to Landon Donovan, Tim Howard, and maybe Clint Dempsey, and we would be getting our first peek at Jürgen Klinsmann’s 2.0 squad. Tuesday’s loss to Belgium pretty much delivered on both of those fronts. We saw the living legends leave it all out on the Salvador field, while a whole nation of soccer-watching fans was introduced to DeAndre Yedlin and Julian Green. The duo took different paths to get to Brazil. Yedlin arrived via the Washington state youth soccer production line. He played college ball in the States (at Akron) and is now a member of the Seattle Sounders. He’s quite literally a homegrown player. Green was born in Tampa, but he is more a product of the European football industrial complex. He plays for Bayern Munich and did time in Germany’s youth setup before choosing to play for the United States, the home nation of his father. FIFA only approved his nationality switch in March. Klinsmann threw Green on in the waning moments, down 2-0, as a Hail Mary. With one touch, Green answered his prayers. 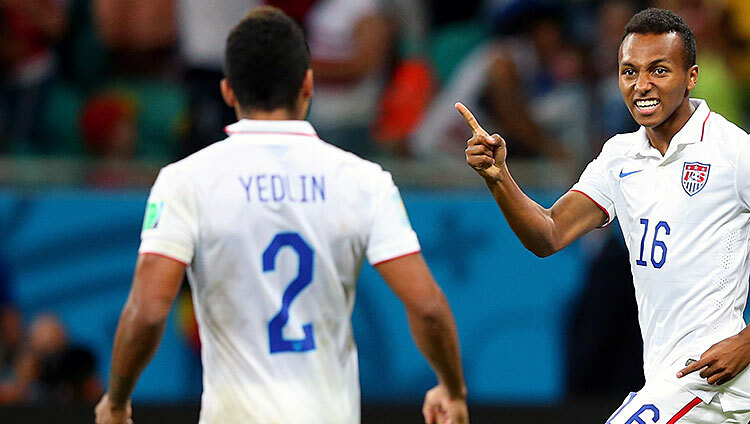 No matter how Green and Yedlin got here, there’s really no getting around it now: They are the future of U.S. soccer. I don’t even mean them, specifically. If everything breaks right, we’ve got our very own Dani Alves and David Silva for the next 10 years. But even if these two wind up never having bigger moments than the ones they had in Brazil on Tuesday, they have introduced a new era. This is the new, open American soccer — an open style of play, and an open idea of what a USMNT player looks like. Couldn’t you feel it when they each came on? Some kind of page was turning. Something was ending, and something else was beginning. Klinsmann was right, he just got it backward. I’m sure this was a big step for Green, but in the process of him and Yedlin making those steps, we were the ones who became emotionally connected. Mike L. Goodman: Sometimes when an idea takes root it’s tough to get rid of it. That’s especially true in soccer, where so much is in the eye of the beholder. Is a striker lazy or is he not getting service? Is a defender getting beaten, or is he not getting the help he needs? So much of how we assess a player after a game is influenced by what we take into it in the first place. So, let’s take a minute to talk about Michael Bradley. Bradley was good against Belgium. Those few desperate gasps of attacking momentum against the Belgian onslaught? Those came from Bradley taking a touch and shifting the ball wide into space for DeAndre Yedlin or DaMarcus Beasley. He had the legs (he always has the legs) to track back 60 yards in the closing minutes of regulation and snuff out Belgian attacks. As the game got more and more desperate, Bradley seamlessly shifted backward and forward, sometimes filling in as a deep-lying playmaker and second defender at the same time. And we haven’t even gotten to the assist, or that orchestrated set piece that almost brought a miracle home. Look, Bradley wasn’t at his best during the group stage. More accurately, he did the most visible part of his job badly. In general, there was a sense that he lost the ball too often and was sloppy in possession. That is true. He also, as was increasingly cited as the tournament wore on, covered more ground than any other player at the World Cup. He also occupied an unfamiliar role, and when Jozy Altidore got hurt, he did it with an unfamiliar strike partner in Clint Dempsey. So hopefully this game, even in defeat, kills the idea of “Michael Bradley is not good enough” before it ever has time to take root. At his best, as an attacking midfielder, Bradley will always lose the ball more than he does as a defensive mid. He’s supposed to (though, at his best, he also won’t do so in the dying moments with a lead). At his best, he’ll also start carving chances for a couple of forwards playing ahead of him, instead of being stuck with only one or less. And, of course, at his best, Bradley will run more than anybody, never tire, and stand up as the face of the USMNT to all who ask, just like he did while the rest of his game briefly abandoned him. Bradley finally played well Tuesday. It wasn’t quite enough to win. But hopefully it will be enough to remind all of us just how vital he is. 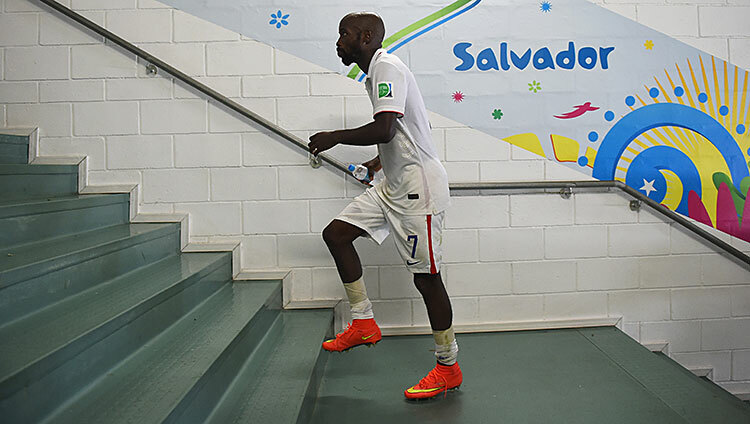 Noah Davis: Because I spend a lot of time watching the United States men’s national team by myself, I sometimes play this game in which I pretend there is a Mortal Kombat–esque power meter above DaMarcus Beasley’s head when he plays left back. As the game wears on, the midfielder turned defender takes hit after hit, is knocked down by bigger, stronger players, and inevitably requires a sub around the 75th minute mark, when the meter reaches zero. Except in Brazil, Beasley, who would be his listed 5-foot-8, 145 pounds only if he had pointe shoes on and weights in his pockets, didn’t wear down. In a tournament in which the younger, fresher American legs of Jozy Altidore, Matt Besler, and Fabian Johnson needed help, the fourth-oldest field player — behind Brad Davis, Jermaine Jones, and Kyle Beckerman — went 90 minutes against Ghana, 90 against Portugal, 90 against Germany, and 120 against Belgium. There he was in the 20th minute on Tuesday afternoon, clearing a cross off the line to save a goal, then leading the break upfield after the U.S. center backs cleared the ensuing corner kick. There he was on a full-field sprint in the 80th minute, another in the 93rd following Chris Wondolowski’s miss, and a third down the left flank in the 118th. Seconds later, he won a freaking header. Beasley was far from perfect, but still … damn, dude. Four years ago, Beasley made a single substitute appearance at the World Cup in South Africa. He earned just a single cap for the Stars and Stripes in all of 2012, a forgotten man. But Jürgen Klinsmann gave him a final shot at a new position, and Beasley thrived. The pre–World Cup narrative focused on Landon Donovan, Clint Dempsey, and Tim Howard, all of whom boast bigger profiles and are likely to retire from international soccer soon. Beasley, who sits on 120 caps (fifth all-time for the U.S.), 17 goals (tied for ninth), and appearances in four World Cups (first), will, too, but he was an afterthought, a quiet, forgotten man on a team of rising stars. Against Belgium, he suffered seven fouls, more than double anyone else on the field. The power meter never moved. 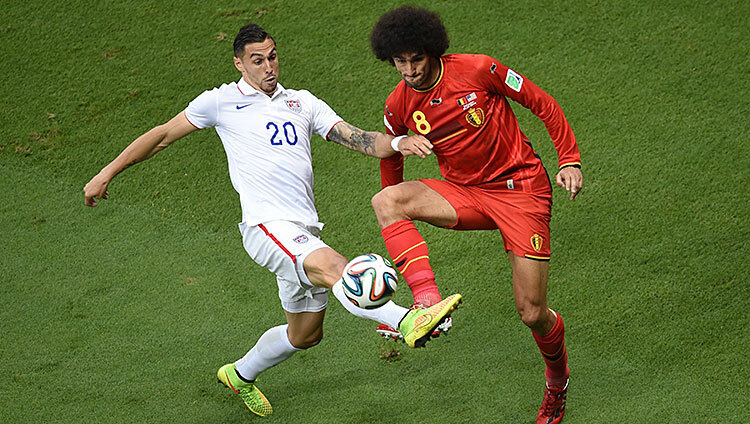 Ryan O’Hanlon: Here are two Geoff Cameron stories. The first: I played college soccer at Holy Cross. Once, we had a preseason scrimmage against Cameron’s University of Rhode Island team. Cameron was taller and way better than all of us. Twenty or so minutes into the game, one of our center midfielders took him out with a studs-up tackle from behind. It is still unclear whether he got the ball. Either way, Cameron looked pretty hurt. The Rhode Island coach came onto the field and threatened to forfeit the rest of the (meaningless) game because, Jesus, it was just a scrimmage. Things cooled down eventually and we resumed playing, but Cameron sat out the rest of the game, we won, and seven years later Cameron was playing 120 face-melting minutes in the knockout stages of the World Cup. Before Brazil, we talked a lot about how this tournament marked the tail end of what’s probably the greatest generation of players America’s ever produced. How it was the last bow for Clint Dempsey and Tim Howard (and Landon Donovan) before the growing crop of MLS and European academy kids took over for good. But this was also the only World Cup for another sub-generation of players — the guys who are 26, 27, and 28; the ones who grew up going to MLS games on weekends, watching Champions League games on weekdays, and otherwise trying to figure out if there was actually any kind of comprehensible pattern to the Fox Sports World programming schedule. We played within a still-nascent nationwide youth-club structure, received hit-or-miss coaching, and almost all of us ended up going to college because that’s just what you did if you wanted to keep playing after high school. Cameron went to West Virginia and then Rhode Island, not playing a professional game until he turned 22. (For comparison, DeAndre Yedlin has played 42 professional games. He’s 20.) In a convenient way, Cameron melds the qualities of the pre- and post-Dempsey eras — big and athletic; naturally and effortlessly technical — and yesterday’s game (most touches and shots blocked, four take-ons, more than nine miles covered) showcased all of that. And I guess, then, I’m telling this story because even though I was hurt and never even played in that preseason game, I’m sheepishly and more than a bit pathetically proud to say that I almost did. Michael Bradley was always a soccer-playing cyborg who just happened to be our age; Cameron was one of us. And the second story? Yesterday, my brother, who is 21, brought a picture of Geoff Cameron to the barber shop, showed it to the guy who was about to cut his hair, and said, “I want to look like this.” He now is the only person in the world with “The Geoff Cameron,” and, well — that’s it. Bill Barnwell: After the loss Tuesday, pundits seemed to agree on the next step for the United States. We know the Americans can compete with the best teams in the world. The next level is to compete with them without having to rely on overly defensive tactics and goalkeeping heroics. That requires more creative, skillful players in attack. Our team is built around one of those right now, American hero Clint Dempsey. The problem? He’s going to be gone soon, and we don’t appear to have much of an idea of how to make another one of him. It’s de rigueur to point out that Dempsey mostly developed outside of the traditional U.S. youth processes that were around at the time. He received virtually no attention from the country’s youth teams, as his record in youth tournaments amounts to 20 minutes as a sub across five matches in the 2003 FIFA World Youth Championship (for U-20 players). The likes of Joseph Ngwenya and Ramón Núñez were drafted before him in the 2004 MLS SuperDraft. Even after he made his way to Fulham at 23, Dempsey was in and out of the starting 11 at Craven Cottage for most of his career there. Nothing about Dempsey’s career would follow any sort of traditional or best-case developmental model. And yet, there is nobody like him in the national pool; truthfully, we haven’t had another player like him during the modern era of this national team. Tab Ramos and Landon Donovan weren’t as daring or audacious. Claudio Reyna didn’t have Dempsey’s killer instinct. Preki didn’t come out of an American youth system and wasn’t anywhere near as impactful on a match-by-match basis. The closest comparison for Dempsey might be, jeez, Earnie Stewart? And even he grew up and developed as a footballer in the Netherlands. We’ve never made anything like Clint Dempsey on purpose or even come close. Dempsey had an impressive World Cup. He scored two of the U.S.’s five goals, nearly adding a third against Belgium in extra time. He put up those numbers while playing nearly the entire tournament out of position, as a lone striker, out of sheer desperation after Jozy Altidore injured his hamstring. With little to no help, Dempsey had to make creative runs, win 50/50 balls flung up the pitch by desperate defenders, hold on to the possession while waiting for runners to arrive, and make useful passes to find teammates in stride, before then turning and attempting to finish. He did that because he’s a great player, but that’s not the best way to use Dempsey. His absence as an attacking midfielder was felt in how frequently the U.S. lost the ball, especially against Germany and Belgium. 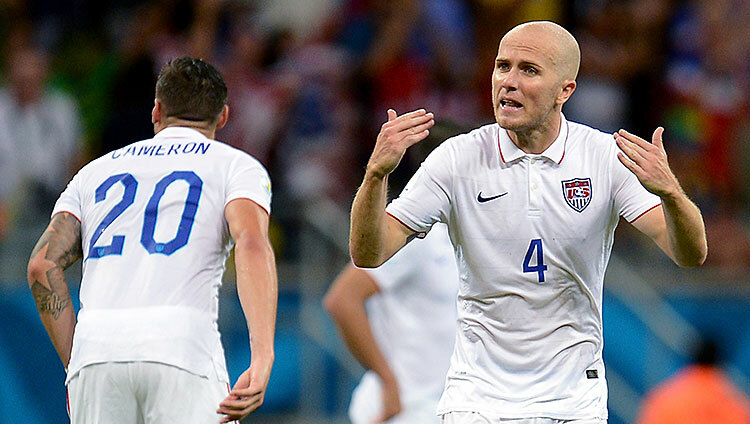 Michael Bradley attempted to fill his role, and, well, you know how that turned out. I don’t know that we would still be in action if Altidore had stayed healthy and Dempsey had gotten to spend the entire tournament as the no. 10, but I don’t think it would have hurt, either. 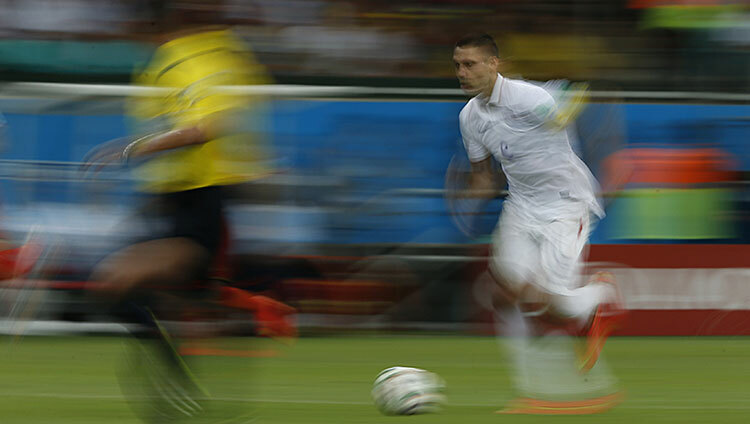 Sadly, we’ve almost certainly seen Dempsey’s last action at a World Cup. Remember that Donovan failed to make the national team for being washed-up at 32; Dempsey, playing in his third World Cup, is already 31. He will be 35 by the time Russia rolls around in 2018, and attacking players 35 or older rarely make an appearance on the game’s biggest stage. Just three forwards (all one-namers: Drogba, Forlan, and Klose) and four midfielders (Karagounis, Lampard, Pirlo, and Ecuador’s Édison Méndez) aged 35 or older made it to this World Cup. I don’t want to be the person who counts Dempsey out, but at the very least, it’s difficult to imagine him being the focus of America’s attacks the way he’s been during this World Cup cycle. And, as you might expect, there’s nobody out there to replace him. Julian Green, for all the promise he showed yesterday, is still really a winger. Somebody like Luis Gil isn’t yet at Dempsey’s level. The closest fit of skills would be that of Mix Diskerud, who was one of two outfield players to make Jürgen Klinsmann’s 23-man squad without getting onto the field in Brazil, but it remains to be seen whether he’ll develop into a player of Dempsey’s class. Then again, there doesn’t really appear to be any sense in projecting or planning for Clint Dempseys to arrive. They seem to come out of nowhere, and all you know is that you wish you had more of them.